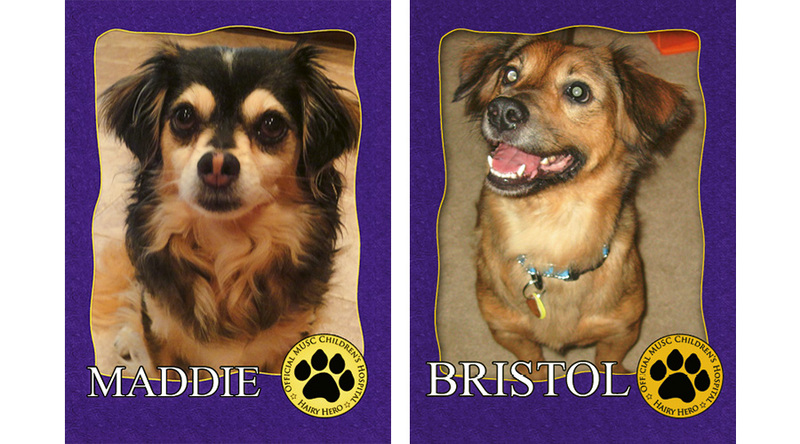 All of MUSC's therapy dogs have trading cards for kids to collect. To donate, visit www.musc.edu/giving/pet. Kathy Sykes (standing at right) brings pooches Bristol—shown with young Sydney and a family member—and Maddie to MUSC twice a week. Many dogs learn to remain at their owners’ sides, or “heel,” but it takes a special canine to stand beside a person and heal. Likewise, only an exceptional breed of dog-lover can unleash joy in strangers struggling through difficult medical situations. And that means that Kathy Sykes, a volunteer with the Medical University of South Carolina’s (MUSC) pet therapy program, and pooches Maddie and Bristol are exceptional indeed. 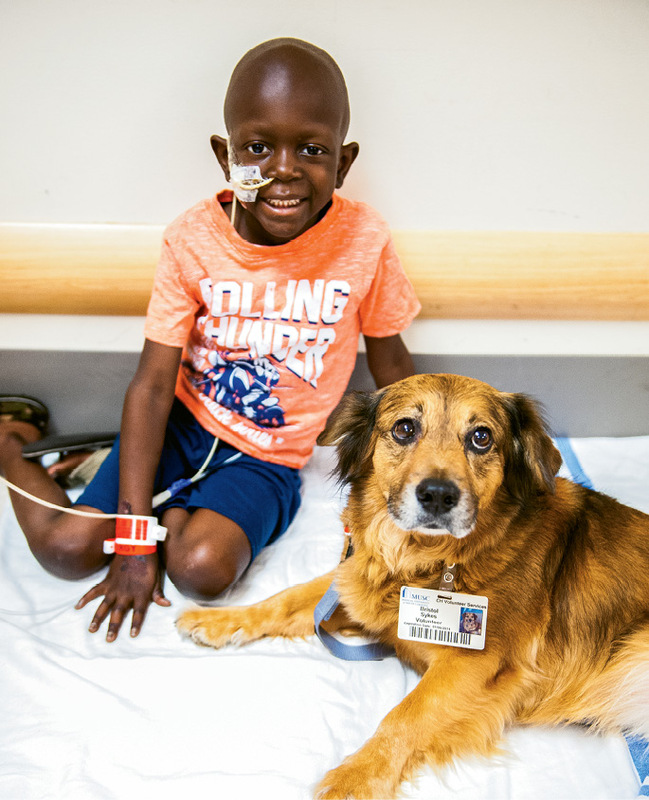 Three years ago, inspired by a nephew who beat cancer as an infant, the James Island resident and her two four-legged friends signed on to the therapy dog team (which currently includes some 40 canines and their owners, who have completed a rigorous training process). Twice a week, Sykes and a pup do a two-hour shift, rotating between the Main Hospital and the Children’s Hospital. For hospital-bound adults, quality time with a lap dog and a good listener is spot on. The Centers for Disease Control and Prevention report that pets can lower a person’s blood pressure, cholesterol, pain, and triglyceride levels, and they’re mighty medicine for loneliness. With a cute stripe down her nose and big brown eyes, Maddie the long-haired Chihuahua is a 12-pound dose of comfort. 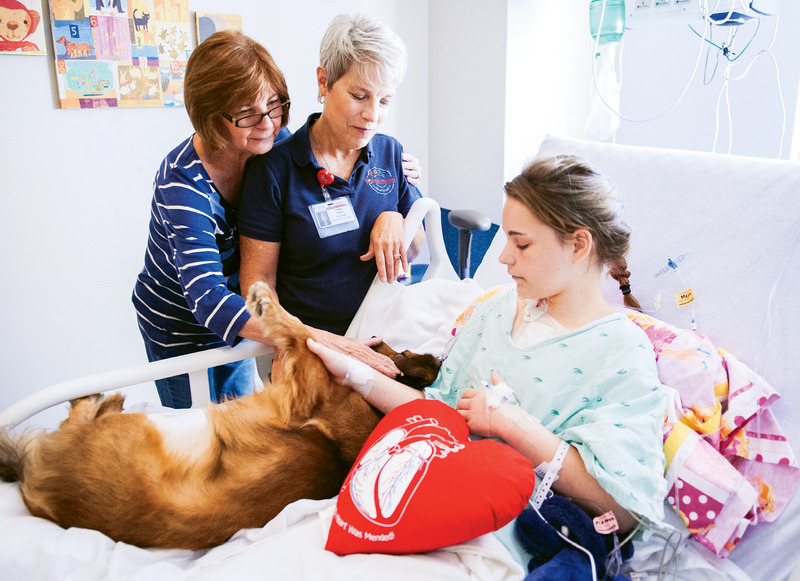 “She happily flips onto her back for tummy rubs,” says Sykes, who finds that while patting the pup, patients often open up about their own pets, families, and more. When it comes to soothing kids, Spaniel mix Bristol is tops. In addition to a trick repertoire including shakes, high-fives, fist bumps, and dances, “she is such a gentle soul,” notes her handler. “Bristol lets kids cradle her, and often when a patient is petting her, she’ll softly touch them with her paw.” Sykes proudly recalls the half hour that Bristol unwaveringly rested her head in a six-year-old’s lap as doctors and interns checked over the girl, who’d reacted to treatment with a head-to-toe rash.